"A journalist for Vox misconstrued what David Chase said in their interview. To simply quote David as saying, 'Tony Soprano is not dead,' is inaccurate. There is a much larger context for that statement and as such, it is not true. As David Chase has said numerous times on the record, 'Whether Tony Soprano is alive or dead is not the point.' To continue to search for this answer is fruitless. 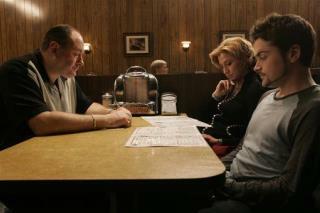 The final scene of The Sopranos raises a spiritual question that has no right or wrong answer." ...and then Bob Newhart woke up from the dream sleeping next to Suzanne Pleshette. However this was actually a dream that Patrick Duffy had because he was still alive and taking a shower. ....or did he really exist at all??? Perhaps it just an imaginary child with autistm looking in a snow globe. Chachi really killed Laura Palmer. Laverne and Shirley were really dead. They just didn't know it. They were dead people that Haley Joel Osment was able to see. But I thought the most interesting thing was when it was revealed that Tony Soprano's best friend Paul grew up to become Marilyn Manson. Basically he was alive and more $$ to be made, and the actor is dead so leave it at that.